What are the Jinkeng Rice Terraces? ﻿Jinkeng Rice Terraces, home to Yao minorities, is beside the famous Pingan village of Zhuang Minority Ethnic and located around 40 km away from Longsheng and 20 km away from Longji Terraces. The highest altitude of the Jinkeng Rice Terraces is 880 meters, and the lowest altitude is 380 meters. ​With an area of 66 sq km, it has two main villages; - Dazai Village at the foot of the mountain with traditional houses built of wood and the Tiantouzai Village high in the mountains, which showcases a panoramic view of the whole area. In between are the Yao people’s two-story cabins nestled against manmade wonder. The layout of the village resembles the terraces fields symmetry, thus making houses appear as if stacked on top of one another. It has rice terraces built into the hillside, which looks like ribbons round the contours in tiered bands. Its ingenious irrigation method exploits the arable land and water resources to the hilt. Its three main scenic spots; West Hill Shaoyue, Thousand-layer Ladder to the Sky and the Golden Buddha Top are aligned in a semi-round shape. 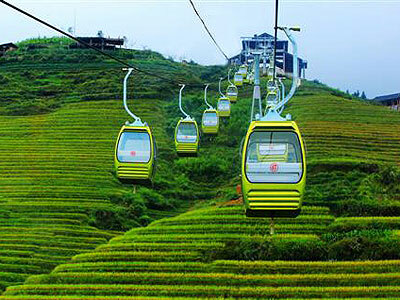 The sightseeing cable car is also present to take advantage of. Terraced field scenery, ancient villages, minority culture are the unique features of the place best experienced in spring and autumn, especially May and October during the seed time and harvest time. Interested in visiting the Jinkeng Rice Terraces on a Tour? Wendy Wei Tours offers a variety of different packaged tours as well as custom tours including the Jinkeng Rice Terraces, among other attractions and destinations. To find out more, please visit our Tours page or Contact Us directly to find out more.